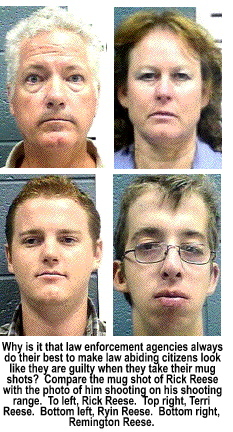 n Dec. 14, 2010 a four-man US Border Patrol task forceWilliam Castano, Gabriel Fragoza, Tim Keller and Brian Terrywere occupying a remote interdiction site in rugged terrain just west of the town of Rio Rico, Arizona. They had been there for 48 hours, waiting for armed drug runners that were operating in that area. Around 11 p.m. they spotted five men moving into the interdiction area. They maneuvered to a spot where they could intercept and, hopefully, apprehend them. Yelling out that they were Border Patrol agents, the five immediately responded with automatic weapons fire. In a short but horrific gun fight, Terry was hit, sustaining a fatal wound. Castano, Fragoza and Keller kept the the five from maneuvering behind them, wounding one of them. Four escaped, leaving their wounded comrade behind. I'm getting ahead of myself. That's the second segment of this article. The first segmentwhat you are reading nowbegan in September, 2009 when the Bureau of Alcohol, Firearms, Tobacco and Explosives [ATF], a division of the Dept. of Justice decided the best way to catch the gun traffickers selling to the drug cartels in Mexico was by giving a pass to the little fishthe gunwalkersusing them as bait to catch the big cartel fish. Who dreamed up the scheme? Government plots to strip the American people of their Constitutional rights are never done in the light of day. And, plans to destroy the Constitution are not done by minions. They are done by those in government who possess the power and have the authority to carry out their plans. Figuring it out, and putting faces and names to the plot, is like putting together a jigsaw puzzle where all of the puzzle pieces are the same size and shape. But, poring over news stories and video footage from 2009 when Operation Fast & Furious began, one of the new key Obama Administration figures in October, 2009 suggested that as drugs were coming north from Mexico, automatic weapons were going south from the United States. Secretary of State Hillary Clinton told Lara Logan of CBS News that "...it is drug demands in the United States which drives the drugs North, across our border, and we have assault weapons and other guns coming South, illegally, to arm the drug gangs against the Mexican army and police." Clinton said, for that reason, the United States shares responsibility for drug war violence. In spite of claims by Secretary Clinton to CBS, and later to MSNBC, that 90% of the guns used by the drug cartels come from the United States, the claim is patently false. Ninety percent of the traceable guns confiscated from drug runners by the Mexican government were licensed in the United States. But, they account for less than 5% of the guns captured by authorities. Since illegal weapons (mostly from China) are not legally registered weapons, attempts to trace the ownership history of those weapons fail. That's why 90% of the traced guns came from the United States. Chinese gun smugglers don't register their "export" weapons so they can't be traced back to them. In a MSNBC interview, Andrea Mitchell asked Clinton about "...the cross-border crackdown on guns that Clinton envisioned. Clinton said: "...we are going to start tracing these guns, we're going to start cracking down on illegal gun sales. We're going to go after the straw men and women who go in and buy these guns; we're going to do much more in trying to prevent them from getting into Mexico...We're going to make this one of our highest priorities." On October 7, 2011, The Examiner reported that Clinton's 2009 statement (parroted by Obama, Holder and Janet Napolitano) that 90% of the guns captured from drug cartel members came from the United States shows, first, that Clinton was in the forefront of pushing false assertions, and that the other ringleaders of the scheme appear to be Obama, Holder and Napolitano. That makes Operation Fast & Furious a joint White House, Justice Department, State Department, ATF, FBI, ICE and HSI projectwith the planning, executionand blame for the death of US Border Agent Brian Terry shared equally by the heads of each agency and the leaders of State, Homeland Security and the Executive Branch. Yes, I can see why Barack Obama asserted Executive Privilege. Operation Fast & Furious could be the catalyst to a historic multiple impeachment hearing in the US House of Representatives. The logic of that scenario makes sense because early-on Obama had Hillary on a very tight leash. He didn't trust his former campaign adversary who, on Wed., Oct. 21, 2009 announced that the United States supported the UN's Conference on the Arms Trade Treaty and the UN Small Arms Treaty. She, in fact, "ceremoniously" signed the UN Small Arms Treatythe reason for Operation Fast & Furious. Theoretically, Holder's purpose appeared on the surface to be what Hillary Clinton claimed it was in an MSNBC interview: to sell guns and ammunition to straw buyers so they could track, arrest and prosecute not only the straw buyers at the end of the day, but the cartel members who bought the illegal weapons. The problem is, not a single gun was traced to a single Mexican buyer; not a single cartel member or gunwalker was arrested and, to date, no one thus far has been prosecuted even though over 2,500 guns were "walked" to Mexico. When those prosecutions begin, the first gun traffickers will be innocent gun dealers from Deming, New Mexico. Since all 2,500 weapons that crossed the border in this sting operation were sold by the ATF through a consortium of "cooperating" gun dealers, the government would be hard-pressed to prosecute any of them since they were acting as agents of the ATF. In other words, the only American "gun traffickers" involved in this sting to date were not gun traffickers. They were cooperative legal gun dealers whom the ATF and FBI bullied into selling weapons to known or suspected straw buyers so the ATF (they said) could then track them to the drug cartels in Mexico. The joint "sting" operation used ATF, FBI and Homeland Security Investigators [HSI] personnel. The only problem is, their planif there ever was a planwas so amateurish that anyone with half a brain could see there was something wrong with the mechanics of the operation since when the gun walkersthe straw buyersbought weapons from legal gun dealers, no one tracked them when they entered Mexico. In fact, no one tracked them from the moment they left the gun shop where the US government sold them weapons they should never have been allowed to buy. When you think this through, you will realize no one wanted to keep the straw buyers on a short leash or identify the gun traffickers they sold to who have contacts inside the drug cartels since the US intelligence community already knows who the major players are. Which means there was a different, far more malevolent, reason for Operation Fast & Furious. Leftwing Congressmen believed the Obama rhetoric that Operation Fast & Furious was initiated solely as means for the Obama Administration to accurately track the flow of guns going into Mexico in order to push for tough new laws designed to more tightly regulate gun dealers (since the 2nd Amendment does not protect those who sell guns, only those who have a right to own them). While anti-gun members of Congress believed that was the sole intent of Operation Fast & Furious, there was, as noted, a more malevolent reason. The reason? The Conference on the Arms Trade Treaty is scheduled to be held July 2 through July 27, 2012 at the UN General Assembly in New York. When Operation Fast & Furious was surreptitiously initiated by the Obama Administration, it was to be the catalyst that would allow the Obama-controlled 112th Senate (which is still dominated by globalist social progressives) to justify ratifying the UN Small Arms Treaty and the UN Arms Trade Treaty. Once ratified, those treaties will supersede the 2nd Amendment and, without expending political capital to repeal it, the private ownership of guns in the United States will be outlawedmaking it easy for any dictator-minded potentate to overthrow the People and end any semblance of liberty in the United States. The foundation of Liberty in the United States is not found in free speech, it is found in the right to own and bear arms. If you think otherwise, look at what the increasingly social progressive federal courts have done to the 1st Amendment's free speech rights. The Constitution pledges that "Congress shall make no law...abridging the freedom of speech or of the press; or of the right of the People peaceably to assemble, and to petition the Government for a redress of grievances." That, combined with the right to worship God where, when and how we choose without any inference from government , is a paramount and inherent right. Yet, the federal courts have diluted both free speech and and religious freedom by coupling them with Articles 18 and 19 of the UN Covenant on Human Rights. Under Articles 18 and 19, we find what you will likely recognize as your somewhat limited rights as they are legally interpreted today: "Freedom to manifest one's religion or beliefs may be subject only to such limitations that are proscribed by law..." According to the 1st Amendment, the government cannot enact any laws that restrict the free exercise of religion. Article 14 says: "The right to seek, receive and impart information and ideas carries with it special duties and and responsibilities, and restrictions, but these shall be only as such as are provided by law." Which more closely resembles the current application of the 1st Amendment you remember from your childhood or young adulthood? What you just read? Or: "Congress shall make no laws respecting the establishment of religion, or prohibiting the free exercise thereof, or the right of the people to peaceably assemble, and to petition the Government for a redress of grievances..."
As Americans began hearing what the Democratic Party knew all alongthat Barack Hussein Obama is not, and probably never was, a citizen of the United States, political action groups filed lawsuits to seek a redress of their grievance (whether or not Barack Hussein Obama is a citizen of the United States who is entitled to seek, and hold, the office of President) with the only venue provided to them by the Constitution to address any grievance with the federal governmentor with a man without papers who has refused to produce an undoctored, verifiable US birth certificate. Without such a document, no one in this country can vote in an State or federal electionlet alone be elected to high office in the United States. 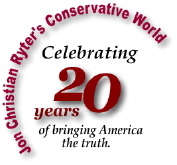 On June 26, 2012, birther lawyer Dr. Orly Taitz filed an ethics complaint with the US House of Representatives against former House Speaker and sitting Congresswoman Nancy Pelosi for vote fraud. Pelosi was subpoenaed to appear at an evidentiary hearing on June 12 in the Marion County Superior Court of Judge S.K. Reid in Indianapolis, Indiana. Pelosi was subpoenaed because she was the former Chairwoman of the 2008 Democratic Party's presidential nominee to make sure that candidate was qualified, under Article II, to hold the office he was seeking. In that capacity, she was obligated by law to legally and thoroughly vet the candidate, and sign an affidavit verifying that the "candidate" was eligible, according to the US Constitution. In 49 of the 50 certifications that Speaker Pelosi signed and sent to each State, she omitted six words: "eligible according to the US Constitution." The State of Hawaii, which knew its native son, Barack Hussein Obama, was really the native son of Kenya and/or Indonesia, refused to accept a ballot certification that did not contain the phase "eligible according to the US Constitution," because left-leaning Hawaiian governor Linda Lingle [R] was not going to put her neck in a noose by accepting an invalid certification and putting someone who claimed he was native born, but had no evidence to show he was born in Hawaii, on the ballot. She informed the Democratic Nominating Committee that without a properly worded certification, she could not allow Obama's name appear on the ballot as the Democratic presidential candidate. According to Dr. Taitz, Hawaii received the only lawful nominating certification for the Democratic candidate. Through her attorney, Pelosi told Judge Reid that the subpoena she was served was served in her current capacity as a Congresswoman and not as the chairwoman of the 2008 Democratic Nominating Committee; and in that capacity, she did not possess any of the documents demanded in the subpoena in Taitz et al v Elections Commission 49DI41203MI012046. Once again, a courtthis time a county courtrefused an American citizen her constitutional right of a redress of her grievances. In Orly Taitz's case, federal courts have at least six times refused her 1st Amendment right of redress of grievance in her multiple attempts to force one Barack Hussein Obama to prove, beyond doubt, that he is eligible to hold the office he claims. Every presidential candidate before him whose citizenship status was disputed had to prove they were legally and constitutionally eligible to run for that office. Obama, who obviously does not qualify, did not. (No one who possesses a genuine birth certificate needs to photoshop a fake one. Anyone with a genuine birth certificate has a genuine Social Security card. And, a natural born or naturalized male citizen who grew up in the United States has a genuine, not photoshopped, Selective Service card since he is required by federal law to carry it on his person at all times. Obama has none of the above. The American people not only have a right to know the birth status of Barack Hussein Obama, the United States Supreme Court has an obligation to demand that Obama stand before them and produce his handwritten, long form birth certificateand witnesses to verify it's authenticity. Because they know he can't, the Democrats have argued that it is a form of "racism" to challenge the eligibility of a black ma. Such a statement is an insult in race-neutral America.. This is not the only "redress of grievance" issue to federal judiciary have refused to here. There has never been an occasion where the courts have heard a case where the People have questioned their government. In the 1980s when Bill Benson and M.J. "Red" Beckman toured the country and retrieved copies of the original 48 States' 16th and 17th Amendment's ratification certificationsand discovered that neither amendment was constitutionally ratified (although both were declared ratified by President William Taft's Secretary of State, Philander Knox and later by President Woodrow Wilson's Secretary of State, William Jennings Bryan after several States who refused to ratify the amendments were urged to do so for the sake of "national unity." In one income tax evasion case, United States v George and Marion House, Assistant US Attorney David Brown told the Houses' attorney, Lowell Becraft in a before-court conference in which Becraft was pleading for a reduction in the charges against his clients, Brown admitted that Secretary Knox had committed a felony by certifying the resolutions, justifying his continued prosecution of the Houses by saying: "...because over 72 years had passed since the crime was committed. ".The view of the Justice Department was that a crime committed by a long-dead Secretary of Statelong after the statute of limitations expiredwas mute, and the government gets to keep the fruits of Knox's crime. This led to a flurry of challenges on the legitimacy of the 16th Amendmentwith no federal court willing to address the grievances of the American people. Any federal judge who refuses the constitutional right of a plaintiff for the redress of their grievances against the government needs to be impeached and removed from office. While the above mentioned issues are not related to Operation Fast & Furious, it's important to understand that they relate directly to the growing arrogance of government and are directly related to the Obama Administration's thinking they have a right to break the laws of the United States if it fits their agenda. 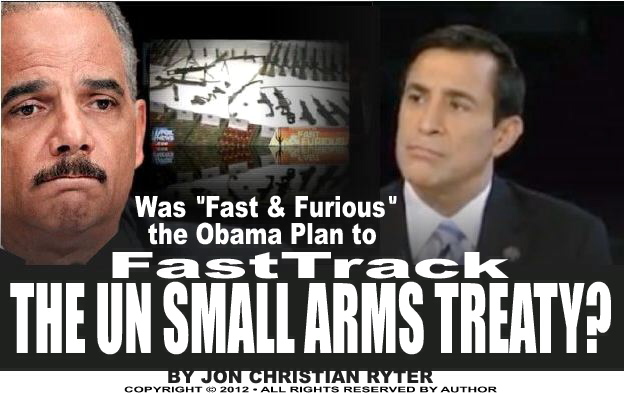 The agenda behind Operation Fast & Furious is to create traceable footprints of what will then look like illegal firearms and ammunition sales from the United States to Mexico that will justify outlawing not only the private ownership of guns in the United States, but the ability of gun traffickers anywhere in the world to import or export firearms and ammunition without the permission of some designated government agency. Without the 2nd Amendment, the arrogance of the US government would be much more "European" where liberty is a retractable "gift." Which, of course, is why the 2nd Amendment is the most important right the People of the United States possess. It guarantees liberty. I suspect if there was no 2nd Amendment, the plaintiffs in the above-mentioned actions would be jailed for raising issues that the princes of industry and barons of banking and business would rather remained obscured in the shroud of secrecy that Obama calls "transparency." By the way, our allies, the Brits? They have no 2nd Amendment. And they no longer have the right to own guns. In England, and in all of Europe, only the bad guys get to own guns because they simply ignore the laws that ban them. How do you protect your family with a steak knife when armed intruders break into your home at night? If you logically study the semantics and ramifications of Operation Fast & Furious, it doesn't take long to realize that Operation Fast & Furious was a gunwalking sting operation without any stingers. The only person the ATF could connect to the weapons they sold were the original straw buyers who continued to return to the legal gun dealer's store to buy more guns under the watchful eye of the ATF and with the consent of the FBI. Increasingly those guns showed up at violent crime scenes on both sides of the border. Yet, the FBI and the ATF continued to sell gunsmany of them illegal automatic 7.62mm AK-47 rifles and automatic pistols and 5.556mm and .223 caliber AR-15 which gun dealers without Dept. of Commerce export licenses cannot legally sell. It is important to know one thing about buying and selling automatic rifles and/or handguns in the United States. No gun dealer in the United States can legally sell any type of fully automatic weapon without possessing a federal export license issued by the ATF through the Dept. of Commerce's Bureau of Industry and Security. No gun wholesaler or manufacturer can sell an automatic weapon to a gun dealer who does not possess a valid export license certificate. It doesn't happen. The consequences are too severe. Illegal weapons in the United States are usually sold from the back trunk of a car. They are not bought here. They are smuggled into the country through point-of-entry inspection sites where less than 2% of the cargo containers coming to the United States from Asia or the Mideast are checked for contraband. In early April, 2010 a woman carrying a State-issued driver's license identifying her as Penny Torres walked into New Deal Shooting Sports in Deming, New Mexico. She completed the proper ATF Form 4473 (Firearms Transaction Record) with her correct name, current address and other identifying information. The FBI approved the transaction. A few days after the initial purchase, she returned and bought at least one more weapon. The owners of the gun shop were Rick and Terri Reese. Every few weeks, sometime sooner, Torres returned and purchased one or two more guns. On or about July 29, 2011, Torres told the Reeses that she would be purchasing several guns because she was having a family reunion at a nearby ranch and everyone wanted to do some shooting. She, of course, was supposed to supply the firearms. After Torres left, something she said kept tugging at Terri Reese's mind. Maybe it was the 30 guns she had already bought. Terri Reese called a Luna County, New Mexico sheriff's deputy she trusted and told him she may have just sold some weapons to a gun-walker. He told her he would report what she said to the ATF and keep her advised. Torres was arrested a few days later and immediately asked the ATF for a deal. She would roll over on the Reeses for a deal. Thinking a crooked gun dealer was a bigger fish than a gunwalker, the ATF took the offer. What the ATF knew is that every gun the Reeses soldparticularly to Penny Torreswere accompanied by properly completed, properly signed and properly vetted and approved ATF Form 4473s. All 30 of them. They had committed no crimeand reported the only customer they had whom they suspected might have. Terri Reese's Luna County deputy sheriff friend failed to tell Terri Reese that Torres' sworn affidavit to federal authorities claimed Rick and Terri Reese were knowingly selling guns to gunwalkersbut then, the deputy probably didn't know that. .What the deputy would likely have known is that every gun the Reeses soldparticularly to Penny Torreswere accompanied by properly completed, properly signed and properly vetted and approved ATF Form 4473s. All 30 of them. There were no flaws in their paperwork. They were going to be the government's clay pigeon. They just didn't know that yet. And, of course, the deputy would also have no way of knowing that the Dept. of Immigration Control & Enforcement authorized a month-long sting operation on the the Reeses through a federal agency known as Homeland Security Investigations [HSI]. Because Terri Reese did what the law prescribed and reported a suspected gunwalker to the federal authorities, there were now four federal agenciesthe FBI, ATF, DEA and now ICEinvestigating the Reeses who, by the way, had done nothing wrong, and who were not participants in Operation Fast & Furious. The undercover gun buyer was. The straw buyer was an undercover informant (code named) Roman who was a drug and human smuggler trying to earn a reduced sentence or perhaps, if he was lucky, deportation and no jail time. His fate rested on building a solid case against the Reeses. To build a solid case against the Reeses, Roman needed to buy several gun and ammunition as he dropped hints that he intended to transport the guns and ammo to Mexico where he intended to sell them to drug cartel members. The trick was to do it in such a way that he wouldn't tip off the Reeses and keep them from selling him the weapons. Because Terri Reese had turned in Penny Torres (who would now be a government witness against the Reeses when weapons violation charges were ultimately filed against them), HSI knew they were dealing with an innocent, lawful gun dealers whom they were now preparing to deliberately frame. How did they do it? Roman, who spoke only broken English, discovered on his first visit to New Deal Shooting Sports that none of the Reeses spoke Spanish. The task became easy since Roman simply threw out his hints in Spanish as the Reeses completed Roman's Form 4473 and waited for FBI approval to complete the firearms transaction. One of Rick and Terri's two sons, Ryin Reese, had recently opened a second family gun store in Las Cruces. His brother Remington worked for him. 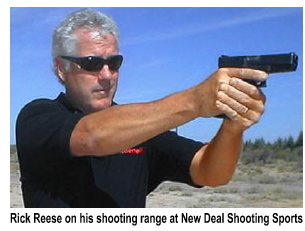 When an ATF SWAT team hit New Deal Shooting Sports, they simultaneously hit the new store in Las Cruses. Everything in the new store was seized as well. When the Reese familyRick, Terri, Ryin and Remingtonhad their day in court for their arraignment, the tape Roman wore to entrap them by throwing out hints in Spanish that he might be taking some of the guns he was buying to Mexico, had been translated into English. What the court received was an English-only typed transcript, suggesting by the silence of the prosecution, that the whole dialogue took place in the gun shop in English. The judge felt there were enough hints where the guns were going that the Reeses should never have sold them to a man they should have recognized as a gunwalker. The arrest of the Reese family resulted in the confiscation of virtually everything the family had accumulated over 17-years in business and over 25-years of marriage. In addition to all of the inventory in New Deal Shooting Sports, the ATF seized all of their money, bank accounts as well as all of their financial records. The only thing the ATF left were piles of clothing in the middle of the floor in the bedrooms. The seizure included the home and all furnishing in it. Police announced they found a "bunker" full of weapons under the gun store in Deming. Let's clarify the nouns in their discovery. The gun store's inventory was stored in the basement of the building. No "bunker." Basement. Only in the minds of the antigun leftwing media conspiracy nuts is an ordinary basement a bunker. The purpose of doing this is to make sure the accused person or persons lack the financial means to hire adequate legal representation, forcing them to use inexperienced public defenders to defend them against experienced federal prosecutors. Public defenders, usually recent law school graduates whose first job after passing the bar is in defending felons who were caught red-handed. Most cases are plea-bargains. Rick Reese's step father, Jack Stewart and his mother, Marge Reese Stewart retained an Albuquerque law firm to represent their son, his wife and their two grandsons. The retainer was $100 thousand. The Stewarts managed to come up with $50 thousand, and they launched a Reese Defense Fund to raise the additional funds needed to properly defend this family. The fund is controlled by the First Savings Bank, 520 South Gold Avenue; Deming, NM 88030. The contact person at the bank is Patricia Arias. To contact her, simply email to patricia_keeler@firstsavingsbank.com or call her at (575) 546-2707. At this point, believing that the US government would never deliberately frame innocent people when there are enough guilty ones to go around, you might be asking yourself why would HSI go out of its way to frame innocent people? Perhaps you should rephrase the question and ask why US Attorney General Eric Holder would sanction the framing of innocent people? This is, after all, his scandalfor the moment. And the blood of US Border Patrol agent Brian Terry, who was killed with a weapon from Operation Fast & Furious, is also on his hands. Fox News contributor and fired NPR commentator Juan Williams defended Obama's assertion of Executive Privilege over Brian Terry's death with a shrug, "Hey," he said, "people die." Since the buck has to stop somewhere, and because Barack Obama is ultimately responsible for Operation Fast & Furious because of what Operation Fast & Furious was supposed to accomplish, he has cloaked himself with Executive Privilege. That leaves Holder exposed and holding the proverbial bagfor the moment. On March 18, 2012 Andrew Brietbart published a 1995 video made by then US Attorney Eric Holder that depicts his strident determination to outlaw the private ownership of guns in the United Statesby any means. 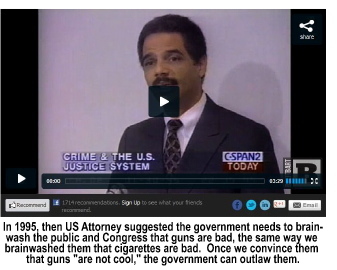 In 1995, in the attached video, Holder says "We must brainwash people against guns." He might as well have added, "How else are we going to subvert them?" What he did say was that the Justice Department needed to "...have an informational campaign to really change the hearts and minds of people in Washington, DC, particularly our young peoplethe way we've changed attitudes about cigarettes." Of course, the campaign against cigarettes was based on lies and half truths. The anti-smoking campaign claims it is scientifically-proven that smoking causes cancer. What kills cancer victims is the FDA which protect the cancer industry from the cures that do exist. Smoking will kill you if you smoke long enough. Not from cancer. From either heart or lung disease. Additionally, smoking is not a Constitutional right. Owning firearms is. In the 1939 gun case, Miller v United States (307 US 174) Associate Supreme Court Justice William O. Douglas, who wrote the opinion noted that "...based on the privileges standardized by the States in the 18th century, the general publicnot State-controlled militiashas to be as well-armed as its central government since the people, and the States, view the federal government as much, if not more, a threat to liberty than any foreign intruder on American soil." Since 1939, the left has done everything they can to keep gun law cases from reaching the Supreme Court. The last one to do so was District of Columbia v Heller that overturned the District of Columbia's ban on the private ownership of handguns. Operation Fast & Furious was implemented to achieve a total and absolute ban on the sale and ownership of all firearms in the United States of America in a way, the left believes, the Supreme Court will be obligated to upholdthrough the UN Small Arms Treaty. If that's true, Operation Fast & Furious originated in the Oval Office. And, if it did, I can understand why Obama asserted Executive Privilege. Doing so suggests he may have deliberately attempted to undermine the Constitution of the United States and the Bill of Rights. Operation Fast & Furious could very easily be construed as treason if the right name was attached to it. What, at the moment, is an impeachable offense only for Eric Holder and Assistant US Attorney General Ronald Weich could very quickly become an impeachable offense for Barack Obama. Remember, the "crime" in the Watergate Scandal that brought down former President Richard Nixon wasn't the break-in of the DNC headquartersit was the cover-up. Whomever approved Operation Fast & Furiouswhether it was Obama, Holder, Weich (an Obama appointee), or someone else in the Obama Administration, as Harry S. Truman noted, the buck stops in the Oval Office. Logic suggests that you assert Executive Privilege only when you know that somewhere along the evidentiary trail, the footprints cross your path and implicate you. ATF whistleblower John Dodson told Congress that ATF officials never intended to reveal their role in the gunwalking scheme. That makes it clear that they needed a fall guyor a family of fall guys. The Reeses drew the unlucky short straw. Terri Reese's call to her Luna County deputy sheriff friend may not have caused her family's downfall after all. It may well be that Penny Torres was a government gunwalker, and the Reese family was being set up by the ATF in 2010 to be one of a handful of honest gun dealers who were being targeted to take the fall. When Terri Reese got suspicious of Torres, Roman took her place. There is at least one other legal gun dealer who was targeted at the time the Reeses were being set-up by the ATF. Where's there's two, there's likely a couple more. It's a certainty that the ATF, FBI, the DEA and ICE weren't too anxious to file criminal charges against "cooperative" American gun dealers who participated in Operation Fast & Furious because they could incriminate the government in its gun sting gone bad. But the Reeses looked pretty good for the fallthey weren't part of Operation Fast & Furious. 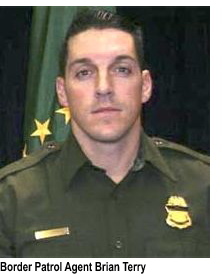 Particularly after US Border Patrol Agent Brian Terry was gunned down on Dec. 14, 2010, about six months after Terri Reese's call to the Luna County Sheriff's Dept. that she believed she might have sold some guns to a gunwalker. The Reese family was indicted in a 30 count indictment by a federal grand jury in Albuquerque, New Mexico on August 24, 2011. ATF Special Agent John Dodson stepped out of the clandestine shadows and into the media limelight on June 18, 2012 to tell Fox News that he became a Congressional whistleblower in June, 2011, telling Congressman Darrell Issa's [R-CA] House Oversight Committee that the weapons that gunwalkers were buying from the ATF at US gun shops began turning up at crime scenes in the United States and in Mexicoand the ATF did nothing. Only one thing happenedEric Holder's Justice Department disputed Dodson's claims until congressional investigators proved Dodson right. At that time, Holder became the center of a much expanded investigation that suddenly involved the Dept. of Justice, the ATF, the FBI, ICE and Homeland Security Investigations (which is controlled by ICE). This was more than a border gunwalker scheme. This was a covert Obama Administration scheme with complicated international implications. This is the stuff that leads to impeachments of high-ranking government officials. And, once again, at the risk of being repetitous, the buck always stops at the Oval Office. The guy in the White House is always responsible for what his underlings doparticularly when he tries to protect them not by concealing their criminal wrongdoing but by trying to conceal his own covert op to justify the ratification of two anti-gun treaties that will supersede the 2nd Amendment and bring about the outlawing of the private ownership of guns in the United States.